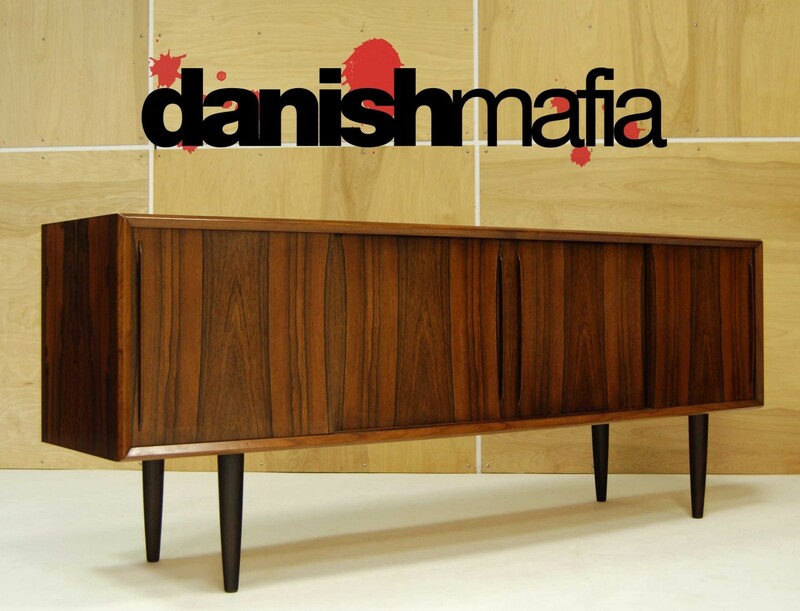 his is a MONUMENTAL Mid Century Danish Modern Rosewood Credenza / Sideboard. 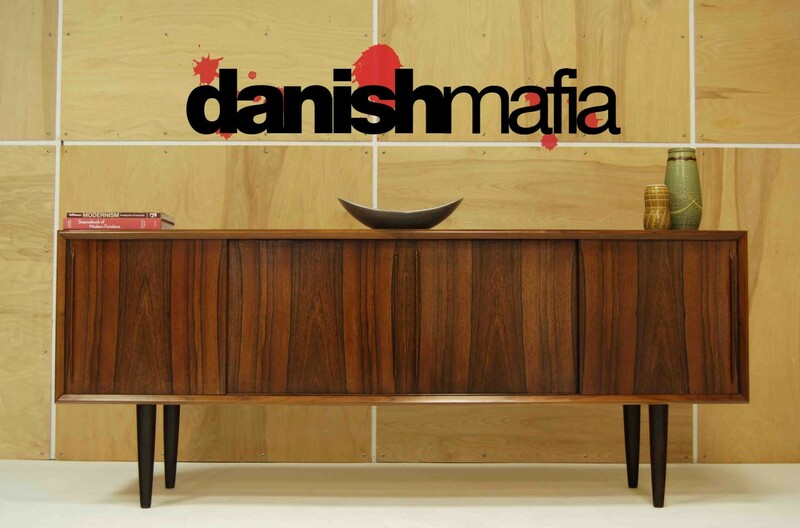 We have hand selected and Imported this authentic 1960′s Danish piece straight from Copenhagen Denmark. This is a Very Large piece so it needs the right home. Perfect used for your Flat Screen T.V. 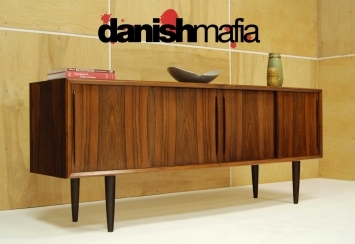 and Media Component storage or in your Mid Century Dining area to store your Dinnerware. Notice how the front actually has a bow, this is an outstanding detail and really sets this piece apart. The Brazilian Rosewood Grain is Exceptional on this piece, the fiery reds, oranges and blacks are truly stunning in person. Our pictures don’t even come close to capturing the true beauty of this designer piece. 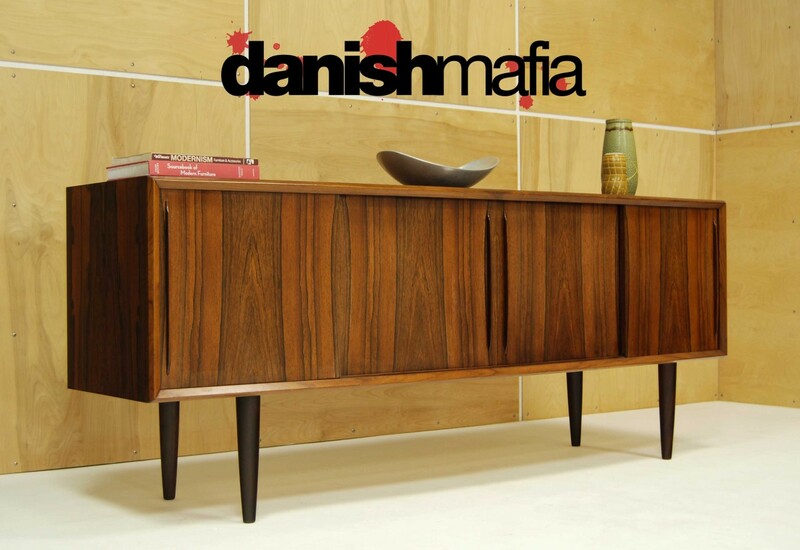 Smooth Sliding doors with simple Modern pulls, so indicative of other designs we’ve had by Kofod Larsen in the past. The Interior is Fully Finished in Red Mahogany. The middle Interior reveal a large space with single, adjustable shelf that is great for many uses, including housing your media components. Another storage opening on the right side. The left side features a series of 4, felt lined drawers, perfect for Silverware or other goodies!! Sitting atop 4 Solid Rosewood “Pencil” legs, gives this piece the Modern Floating look that is so sought after by decorators today. The Piece would look Great in your Entry Way, Living room or in a Bedroom. 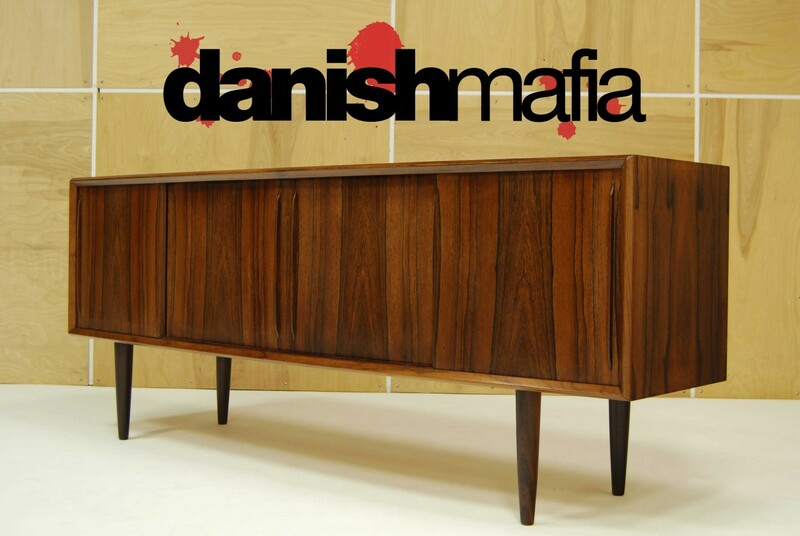 We have more Danish Credenza’s in both Teak and Rosewood available through our website. Overall condition is Excellent. This piece is VERY clean. Doors and drawers opperate smoothly. You may find a few, very faint blemishes if you study this piece closely, but nothing that takes away from the beauty or value of this piece. Contact us for detailed photos of condition as we always try to show the worst of any age related wear. 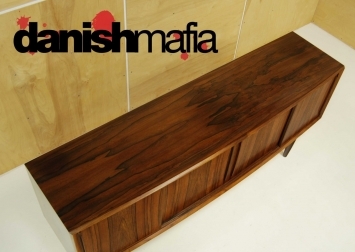 #1- We can have this beautiful piece Custom Pro Packed & Shipped right to your home for approx. $285. Please contact us with your zip code for details and an exact quote prior to bidding. OUT OF STATE BUYERS, YOU PAY NO SALES TAX! !